what do you know, an ex-flame found me on facebook. a friend of a friend of a friend whose classmate was his friend was the link. i should remember to change my profile picture to that egg-hatching witch so no one would ever ID me again. anywho, he sent me a link to a youtube video of johnny mathis' rendition of "the twelfth of never" which he used to sing to me when we were dating. of course i had to match it with this photograph, which would just do well for today's posting, continuing on the theme of what photographs i would hang in a gallery. looking further into the archives, i found this shot of three bancas when i visited the old country four years ago. 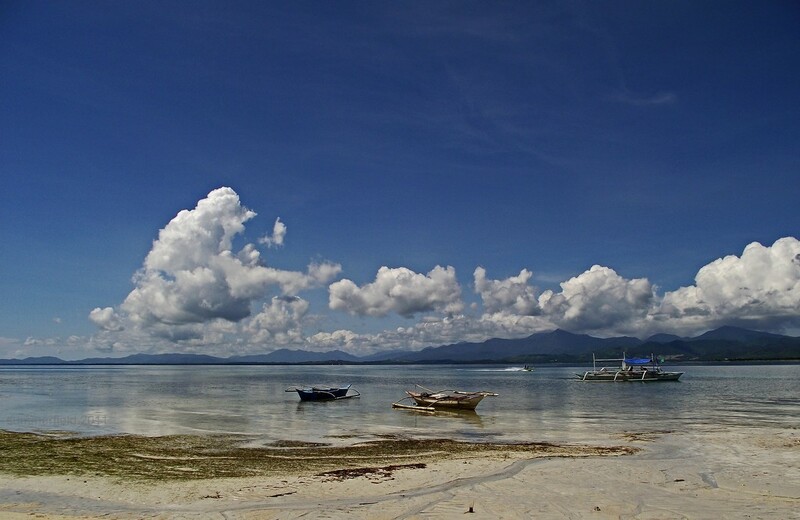 this was in honda bay in the islands of palawan. this lead me to the conclusion that should and when i would have the opportunity to do an exhibit, 'water' (as in bodies of water) would be my theme. this is a little bit off with the clouds on the right abruptly cut off. but i wasn't aware of composition and such at the time; well, i was, just that i didn't pay too much attention to them. thank you for your kind visits and comments; know that they are truly appreciated. What a wonderful scene. It feels so peaceful. Very tranquil scene, you can see for miles! That is one of the bothersome things about Facebook, people who you thought were well out of your life pop up like weeds! I think i might have put a vignette on this to merge the clouds. Its got a grey and wide POV and the boats are so interesting! This shot is better than the picture I've got on the wall from Malaysia! Still a beautiful composition! It's a very relaxing image! Love this photo. Very mellow. Love those clouds. They look like they are flying low. Love to the look of the water with the reflection of the clouds. There is a lot to see here. This is gorgeous and yes, you do take fabulous water shots! I personally find it amusing when people find you on facebook. Better they should declare themselves than stalk around behind your back! Gorgeous, and now I know what a banca is. So beautiful, and tranquil! Love how clear the water is on the lower left.....feel like I could stay there forever! !